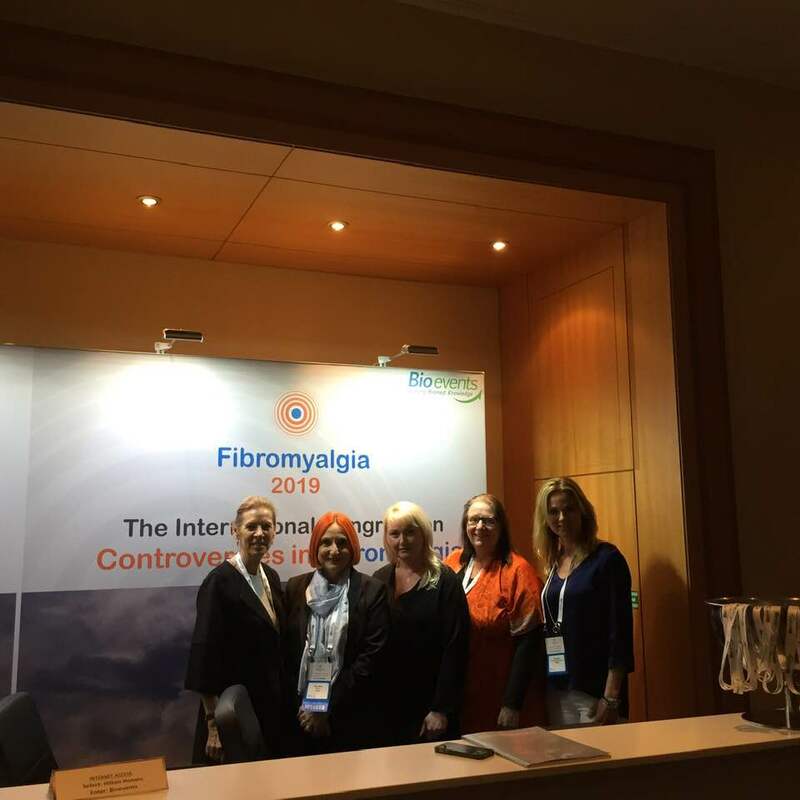 Several ENFA members recently attended The International Congress on Controversies in Fibromyalgia, held in Vienna, Austria between March 4th and 5th, 2019. Here, ENFA member Eva Deurloo, representing Fibromyalgiförbundet, Sweden, provides a summary of topics discussed during the conference. We gathered in Vienna, Austria for ‘The International Congress on Controversies in Fibromyalgia’, a congress focusing on all aspects of fibromyalgia, with the purpose of sharing new and emerging thinking within the field. Chaired by Jacob Ablin and Piercarlo Sarzi-Puttini, a wide selection of international speakers presented across the two days. Fibromyalgia used to be, and somewhat remains today, a controversial condition, surrounded by several myths. While the condition is becoming more accepted in certain countries, the same cannot be said for other areas, where stigma and ignorance of fibromyalgia remain. Even as our understanding regarding the pathogenesis and neuroscience underlying fibromyalgia and chronic pain increases, heated controversies remain regarding many aspects of fibromyalgia, concerning its place in medicine and society, as well as the best ways to improve quality of life for those living with fibromyalgia. An increasing body of research is slowly building the evidence base for fibromyalgia. In addition, the setting of treatment guidelines nationally and internationally, recognition of fibromyalgia existing alongside other rheumatic and musculoskeletal diseases, and an increasing public awareness of fibromyalgia aided by celebrities such as Lady Gaga, are all facilitating a more accepting and understood world for the fibromyalgia community. However, the controversies alluded to in the title of the congress are rooted in the lack of common diagnostic criteria and an unclear pathogenesis. There have been four sets of diagnostic criteria published within the space of ten years, which has led to some confusion as different criteria identify different groups of patients. Fibromyalgia is not a new occurrence though. Historically, fibromyalgia-like conditions have been described by healthcare professionals by different names, but it was not until 1986 that the condition ‘Fibrositis’ was mentioned in the academic literature. The attitude at this time was that this is nothing to be taken seriously. The change came with the publication of the 1990 American College of Rheumatology (ACR) criteria, which was a huge step forward. This criteria for diagnosing fibromyalgia enabled more research to be done into the condition. Subsequently the picture of fibromyalgia has become clearer and more accepted by the medical community, even if much more work is still to be done. Why are we so afraid of fibromyalgia? According to one study presented, General Practitioners in Norway rated diseases according to their perceived prestige and fibromyalgia was last on the list. One likely reason for this is the uncertainty about diagnosis, potentially hindered by the confusing number of different diagnostic criteria. We should be more confident in setting criteria which will lead to better understanding of the condition among healthcare professionals. The more unconvinced the doctors are of the diagnosis, the more people living with fibromyalgia feel the need to prove that they are unwell. Ultimately, this can lead to frustration and distrust between those living with fibromyalgia, and healthcare professionals. As long as fibromyalgia remains a symptom-based diagnosis with no targeted medical treatment, we have to demonstrate to healthcare professionals the importance of the biopsychosocial model. Unfortunately, most healthcare professionals are still are not willing to treat people living with fibromyalgia, often because they don’t know what to do, but they may accept the diagnosis. In order to treat people living with fibromyalgia using a biopsychosocial approach, you need a lot of time. Time, in a modern healthcare setting, is often scarce, and it is therefore difficult to apply this model. There are also other aspects to consider in patient-centred care. The availability of social support is immensely important. Striving for a multimodal approach that addresses the psychosocial and biological aspects of fibromyalgia is warranted. One way to address the close link between psychological wellbeing and severity of symptoms, is to integrate Cognitive Behavioural Therapy (CBT) in a treatment protocol alongside pharmacological treatment. In addition, clustering people with fibromyalgia into sub-groups may also make it easier to tailor treatment to the individual needs of each person with fibromyalgia. Ultimately, the aim is for a therapeutic alliance where care becomes a collaboration between the individual with fibromyalgia and their healthcare professionals; where expertise is recognised from both parties. Chronic widespread pain is diffuse pain in at least 4 of 5 body regions and is associated with significant emotional distress (anxiety, anger/frustration or depressed mood) or functional disability (interference in daily life activities and reduced participation in social roles). Chronic widespread pain is multifactorial: biological, psychological and social factors contribute to the pain syndrome. The diagnosis is appropriate when the pain is not directly attributable to a nociceptive process in these regions and there are features consistent with nociplastic pain and identified psychological and social contributors. The new designation of nociplastic pain could help to describe the pain that underlies many different chronic pain states, including fibromyalgia, complex regional pain syndrome, and other types of musculoskeletal pain such as chronic low back pain, as well as visceral pain disorders such as irritable bowel syndrome and bladder pain syndrome. However, “nociplastic pain” is not a diagnosis; rather a way to understand the neurobiological workings of the nervous system that lead to pain when they go astray. The role of patient associations was raised during the congress, with ENFA´s President, Souzi Makri explaining the objective of ENFA and how the organisation works. She mentioned the written declaration presented to the European parliament to petition for the recognition of fibromyalgia as a condition, as well as examples of surveys initiated by ENFA and how the results have been used to raise awareness and influence political decisions. There was a lot of focus on the genetic components of fibromyalgia, where a lot of research has been carried out. In the UK, they have developed methods for studying large populations and the results suggest a strong genetic link for relatives with fibromyalgia. One recurring fact in a lot of research was the role of MicroRNAs (a type of molecule found in cells and in blood containing information that has been copied from DNA), where the profiles differ between people with fibromyalgia and ‘healthy’ controls. MicroRNAs may well hold the key to unlocking the mystery of fibromyalgia. A better understanding of their role could lead to better subgrouping of the disease, new treatments and improved genetic research. However, genetics alone can´t explain why some people develop fibromyalgia. Environmental exposure also plays a large role. Once you have the genetic profile, triggers such as stress, trauma, surgery and so on can set off the process. It has been estimated that 50% of causes may be genetic, and 50% may be environmental. One question which we still don’t know the answer to, however, is whether opioid use to manage fibromyalgia may affect the genetic makeup of future generations. There are well documented psychobiological mechanisms in chronic pain. With accumulated stimulus, like with chronic back pain, nerve cells can learn and change. We know that fear and stress can aggravate pain. We respond with one or several physiological functions to stress such as: change in blood pressure, sweat and muscle tension. Researchers have noticed that people with fibromyalgia with high blood pressure rate higher pain intensity in tender point examination. It is called Baroreflex sensitivity – the higher the blood pressure in stressful situations, the higher the level of pain. This is commonly found in people with chronic pain. The system learns to increase blood pressure in stress by classical conditioning. There are treatments available to change the baroreceptor response with training, which can contribute to a reduced systolic blood pressure and subsequently, less pain. For healthcare professionals, it is important that they are aware of fibromyalgia especially ahead of an operation. In one study, patients filled in a questionnaire about fibromyalgia symptoms pre-operatively, and a higher score correlated with higher drug dosage to control pain post-operatively. It was reported that you may also respond better or worse to treatment according to which ‘type’ of fibromyalgia you have (though typing is not currently used at diagnosis). Some people have chronic widespread pain from an early age (primary fibromyalgia), and some experience fibromyalgia as a co-morbidity, after diagnosis with other forms of rheumatic and musculoskeletal disease like osteoarthritis (secondary fibromyalgia). It is believed that those with secondary fibromyalgia are likely to respond better to treatments. This also highlights the need for better screening tools to identify the different ‘types’ of fibromyalgia. The brain actually changes with chronic pain – certain areas shrink and some grow. The nervous system learns to behave in a maladaptive way. There are, however, ways of “re-tuning” the brain. These methods are called neuromodulation and are a form of therapy and also way of thinking. Interventions tested include electrical, chemical and mechanical stimuli. Research is going on to see how we can promote normalisation of the sensory motor integration and break vicious circles with different treatment-methods. In several studies, hyperbaric oxygen therapy was used with good results. In order to break the vicious circles of chronic pain, we need to find ways of influencing the nervous system. As fibromyalgia is a pain function disorder with a multilayer nature, you can´t solve all of the problems with medicines. You need a multimodal approach. There has been a shift in attitudes, with complementary and alternative medicines becoming more accepted. A proposed cost-effective treatment programme should include patient education, exercise, hydrotherapy, mind/body approaches and meditative movement (such as tai chi, qigong and yoga). Cognitive behavioural therapy can also lead to pain relief, better quality of life and increased self-efficacy. Acupuncture has been viewed as a valid treatment too, but larger studies are needed to validate this. Diet and nutrition are interesting fields with a lot of potential. There are facts emerging, but the picture is not totally clear as to which diet could be most suitable in fibromyalgia. For example, glutamate seems to aggravate sensitisation for people with chronic pain. Supplements which were been discussed as potentially useful included: vitamin B12, vitamin D, Folic acid, and magnesium. Weight control is another critical factor in the management of fibromyalgia. Many healthcare professionals state that new therapies with improved effectiveness are needed for people with fibromyalgia. People with fibromyalgia are simply not satisfied with current results, with anecdotal evidence of them stopping their prescribed treatments and switching to other medicines. The therapy window is very narrow when it comes to value of effect versus side effect. None of the approved medicines appear to combine effectiveness necessary to control symptoms and tolerability needed for long-term use. Drugs targeted towards fibromyalgia act on different neurotransmitter pathways, and so you simply don’t know who will answer to which treatment. There is today no single medicine that works on centralised pain. Medicinal cannabis is a controversial subject and a hot topic in relation to chronic pain. In Israel, many people ask their doctors for cannabis and it is frequently used by people living with pain, illicitly or legally. Cannabis is not a new substance and traces of hemp cord dating back over 8000 years have been found. A medical manual written in 1899 suggested the use of cannabis for many conditions. In treating fibromyalgia, we need one medicine for treating pain, improving sleep and enhancing mood; with some people thinking that cannabis could be the solution. The flipside is that long-term effects are still unclear. When discussing medical cannabis, it is important to keep terminology clear. Endocannabinoids are naturally produced in the body, whereas cannabis that is consumed consists of either synthetic or naturally-occuring cannabis. The substance tetrahydrocannabinol (THC) within cannabis causes initial euphoria and relaxation but is also a depressant and can affect memory. Cannabidiol (CBD) oil, on the other hand, is a different compound within cannabis; a milder form of the drug which does not contain any psychoactive ingredient. There have been no studies about addictiveness, or the risks associated with long-term cannabis use. There has also been a motion presented in the European parliament that you may treat people with medicinal cannabis if appropriate. Some people hope that, after enough research and more rigorous testing, medical cannabis could present an alternative to opioids. The congress concluded by looking towards the future of fibromyalgia research, which was suggested to include a search for more biomarkers, which could aid diagnosis and subsequently change public perception of the condition Neuromodulation, genetics, small fibre neuropathy, diet/nutrition and neuroinflammation are other interesting and promising areas of research.